Searching for something completely new and different to add to your client's landscape or garden? 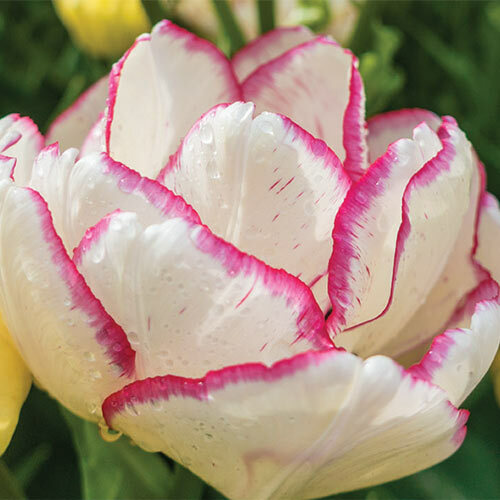 Consider Belicia, our new double-flowered tulip that produces gorgeous color-changing flowers that start out greenish yellow with a carmine-red edge, then mature to creamy white with a deep red trim. This is a true one of a kind that your customers will adore! Not only is Belicia a gorgeously hued variety, but it is also multi-flowering in nature. It reliably offers up enough peonylike blooms to fill late-spring borders, containers, bouquets and arrangements. Like other tulip varieties, it is easy to grow, tolerant of many soil types and virtually maintenance free.